Oriented Strand Board and Wafer-board are structural panels made from thin, short wood wafers that are bonded together with a waterproof phenolic adhesive. While waferboard contains wafers that are randomly arranged, oriented strand board contains wafers that are narrower and that are oriented in the long direction of the panel. This gives the panel added strength and rigidity in the long direction. The designation O-i or 0-2 indicates an oriented panel, while an R-i designation indicates a panel containing randomly arranged wafers. The panels are formed into sheets 4 ft. (1.2 m) wide and usually 8 ft. (2.4 m) long. The minimum thickness that should be used is 5/16 in. (7.9 mm) for studs up to 2 ft. (600 mm) on centre and 1/4 in. (6.35 mm) for studs up to 16 in. (400 mm) on centre, oriented strand board and waferboard sheathing can be installed the same as plywood. Panel-type sheathing, such as fibreboard, plywood, oriented strand board or waferboard, is often applied vertically. The panels are nailed to the wall framework before the wall is raised to position. This sequence helps the wall maintain its squareness, avoids the need for scaffolding, and closes the house in as soon as the framing is completed. Often the window openings are covered by the sheathing panels and are not cut until after the windows are delivered. The sheathing panels can also be applied horizontally, in which case the vertical joints should be staggered wherever possible. A space at least 1/8 in. (2 to 3 mm) wide should be left between the sheets to permit expansion without buckling. The panels are nailed to the fram ing at 6 in. (150 mm) on centre along the edges, and 12 in. (300 mm) along the intermediate supports (Fig. 78). Plywood is usually sheathing grade, unsanded, laminated with a waterproof adhesive and may contain knots. The minimum thickness for exterior type plywood wall sheathing should be 5/16 in. (7.5 mm) for studs 24 in. (600 mm) on centre, and 1/4 in. (6 mm) for studs up to 16 in. (400 mm) on centre. Sheets are 4 ft. (1.2 m) wide and usually 8 ft. (2.4 m) long. m) wide and generally 8 ft. (2.4 m) long, and is usually impregnated with an asphalt material to increase water resistance. Gypsum board sheathing consists of a gypsum filler faced on both sides with treated paper. It should be at least 1/2 in. (12.7 mm) thick for studs 24 in. (600 mm) on centre and 3/8 in. (9.5 mm) thick for studs 16 in. (400 mm) on centre. It is supplied in sheets 4 ft. (1.2 m) wide and 8 ft. (2.4 m) long. The sheets are applied horizontally across the studs and nailed to the framing members. 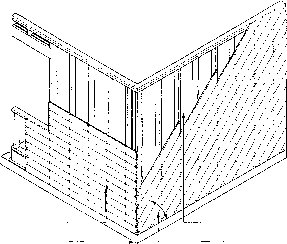 Vertical and horizontal application of panel-type sheathing. '/8" (2-3 mm) space between sheets edge nail 6" (150 mm) o.c. V8" (2-3 mm) space between sheets edge nail 6" (150 mm) o.c. 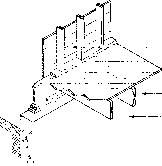 Lumber sheathing application: (A) horizontal and diagonal; (B) started at foundation wall. sheathing joist foundation wall vapour-permeable, waterproof membrane. The others are rigid panels of either expanded polystyrene, extruded polystyrene, polyurethane, isocyanurate or phenolic material. 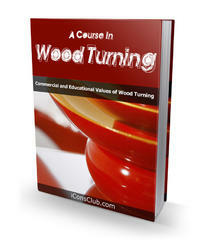 They come in different thicknesses, and the insulating value per unit thickness varies. They are installed on the wall like any other panel sheathing but with special large-headed nails. A good reason for fastening this insulating sheathing before the wall is raised is its lightness and, for some types, its brit-tleness. Even a mild wind can make it difficult to install insulating sheathing on the vertical. Rigid glass fibre sheathing with vapour-permeable membrane can become an air barrier when the joints are sealed with contractor sheathing tape. There are two methods of installing sheathing down to the foundation sill. Either the panel extends beyond the bottom wall plate by the required length and the missing part at the top plate is filled in, or longer panels of 9 ft. (2.74 m) length are used, where available, to cover the wall down to the sill area. It is advantageous to cover the header and sill with the same wall sheet because this reduces air infiltration. Lumber sheathing, which should not be less than "/16 in. (17 mm) thick, is used in boards 6 to 12 in. (140 to 286 mm) wide. It is milled in a shiplap, tongue-and-groove or square-edge pattern. The boards are nailed at each stud with two nails for the 6 to 8 in. (140 and 184 mm) widths and three for the 10 to 12 in. (235 and 286 mm) widths. End joints in the board must be placed over the centre of the studs with the joints staggered on different studs. 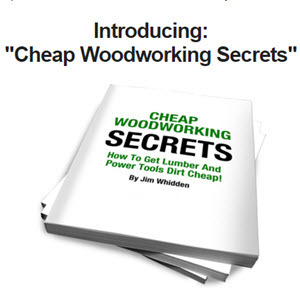 Lumber sheathing may be put on either horizontally or diagonally (Fig. 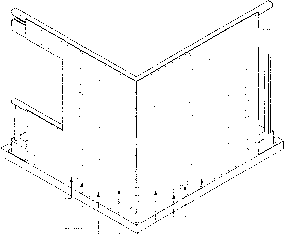 79A) and is extended beyond the subfloor to cover the header joist and the sill plate (Fig. 79B). The angle cuts in the diagonal approach require more time and materials.